Blackstone Models HOn3 D&RGW Long Cabooses feature a more traditional “round” roof style and the 2009 release includes 12 versions representing two distinct eras. Choose from the 1930s-era “Button” herald or the familiar Denver and Rio Grande Western Flying Grande herald. 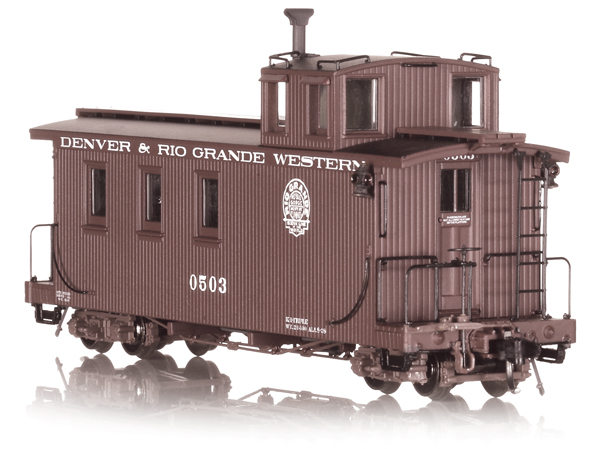 A painted, unlettered version and a special edition caboose with Durango & Silverton Narrow Gauge livery also are available. These cars are offered freshly shopped, as well as in subtly different paint shades of Caboose Red with optional weathering. Detail variations include distinctions in ladder dimensions, window moldings, awnings, cupola grab irons, and the 1950s addition of ladder extensions. We have produced a special collection of additional parts, such as marker lamps and window awnings, for further customization. The wheels also are insulated with electrical pickups on both trucks to facilitate the addition of lighting circuitry, such as the SoundTraxx® Accessory Lighting Decoder (P.N. 810137) designed specifically for Blackstone Models Long Cabooses. These models are sold out at the factory. Please see your hobby retailer for availability.